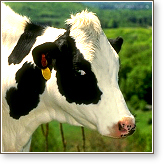 The Holstein cow, originating in the Netherlands, is the most popular breed used in the dairy industry. An adult stands 1.5 meters (58 in.) at the shoulder and weighs approximately 700 kg (1,500 lb). They are placid ruminants who thrive in grazing situations and can live to be 25 to 30 years old. Manipulated through selective breeding programs for over 100 years, the purebred Holstein has been developed into the ubiquitous black and white high milk-producing diary cow. This breed also serves as the foundation stock for international interbreeding, promoting higher yields while adapting to local climates. The five most productive centers in the world are: the EU, the U.S., India, the Russian Federation, and Brazil. The milk surplus is so great in the U.S. that the price is subsidized so dairy farmers are not driven out of business. It is a "river of milk." Breeding takes place when the cow reaches 15 months, and she will have her first calf at two years, followed by overlapping lactation and pregnancy. Cows must be made pregnant in order to continue to give milk. Most cows are artificially inseminated, although painful embryo implantation is also becoming popular. Each gestation period lasts nine months. A male calf is taken away at birth, ideally before he has even taken his first drink (colostrum). This trauma is an extremely upsetting separation for the mother cow as well as for her infant. She will have two to four calves in total before she becomes weak and skinny, at which point she is sent to the slaughterhouse. Few dairy cows live as long as five years. Female calves replenish the milking stock; males are killed (sledgehammer on site) or sent to veal operations within 24 hours. The majority of the 225 million milk-producing cows in the world today live in intensively confined sheds, tethered in standing cubicles while being fed and milked by automated systems. At other times, they are only able to move around in the aisles. The industry has consolidated into larger herds owned by fewer producers with an emphasis on greater milk production. Operating on an industrial scale, herd size can be as large as 5,000 cows at a single facility. The cows are milked two to three times a day, 365 days a year. Once tethered, their teats are dipped in an iodine solution, dried, and are then attached to the vacuum machine. A sensor monitors the milk flow. The actual milking process will last approximately six to eight minutes. The teats are again dipped and the cow untied or returned to the pens. In this zero-grazing system, workers harvest 10 times the natural milk output from each individual cow. Such high production quickly depletes the cow of minerals and nutrients, causing metabolic imbalance and susceptibility to bacterial and viral infections, including milk fever (loss of calcium), grass staggers (lack of magnesium), brucellosis, and salmonella. Most notable is chronic mastitis, a painful infection of the udders that occurs in half of all cows and that requires long-term antibiotic treatment just to control the ratio of pus to milk. In these housing conditions, cows suffer from a variety of leg problems. They must stand for months with their hind legs spread to allow for the enlarged udders, causing lameness. The constant wet conditions and manure-covered floors contribute to fungus, laminitis, and foot rot. With staffing, and especially veterinary services, reduced to a minimum, care and treatment is inadequate, which is why huge amounts of antibiotics are given on a preventive basis. Cows have a digestive system that processes grasses as they graze, but the controlled environment of the dairy business makes that kind of freedom impossible. To increase efficiency and lower costs, cows are given pelleted mixtures that are bulked up with cheap filler made from rendered animals including bone meal, and processed manure. In other words, cows have been turned into carnivores ingesting food that can pass pathogens from other livestock. This is the suspected pathway for the transfer of at least one serious disease (BSE – Mad Cow Disease) entering the human food supply. These concentrated feeds, called TMRs or Total Mixed Rations, attempt to replace critical vitamins and minerals missing when cows can no longer forage, along with ongoing antibiotic and hormone therapy. The controversial use of growth hormones (like Monsanto's Posilac) is found on the largest farms, banned only in Canada and the EU. The object is to increase milk output even though it debilitates cows to such a degree that after a year on these hormones they must be slaughtered. Along with Monsanto, Biotechnology General in Israel is a research leader in rbGH (genetically engineered recombinant bovine growth hormone) and aggressively promotes its protocol in the face of consumer health concerns and legal challenges. The most serious health questions raised are about the safety impact on consumers, for example the increase in breast, colon, and prostate cancer. Nonproductive dairy cows are culled from their herd on an ongoing basis, but always by five years old. Electric prods are used to separate the cows and drive them to be loaded for transport to be killed. This is a frightening experience and, because of the overcrowding and trampling on the trucks and long travel time, severe injuries like broken backs and legs are common. Since the dairy cows being shipped are already weak and depleted, many will be suffering from disease and not survive the trip itself. Upon arrival at the slaughter factory, the still-standing cows are driven off the trucks. The downed animals (those too sick to get up or move) are chained and dragged down, usually left to die without even the benefit of humane euthanasia. The cows are held in crowded pens until they are driven through single-file chutes and onto loading ramps that are up to 60 m (200 ft) long. Continuous flow systems like this can handle 400 cows an hour. Slaughter itself is a two-step process: stunning and bleeding. The cow enters the stunning box where she is placed in a head-restraining device and stunned, usually with a captive bolt gun aimed at the skull. There is a high incidence of ineffective bolt stunning because of the fast throughput killing-line speeds and incorrect positioning, frequently requiring a second or third shot and often resulting in cows being bled while still fully aware (as in Halal and Kosher slaughter). Supposedly unconscious but often not, the cow is shackled by the leg and hoisted onto a moving belt where she is bled to death by slashing the carotid arteries. This is an excruciatingly painful and terrifying experience. Smaller cows and calves are stunned electrically. With electrical stunning, there is a high incidence of the calves regaining consciousness while bleeding. Even as they are being killed, cows will give birth prematurely, and the calves (called "slunks") are pulled aside and separately slaughtered. The skin of fetal cattle is prized for the finest grade parchment, or for the most delicate suede. Their body parts are rendered to extract rennet for cheese making and for gelatin, and calf blood is used in pharmaceuticals. Many so-called "humane slaughter" schemes have been tested in an attempt to minimize fear, hysteria, and panic; however, whistle-blowers have documented that cows continue to struggle and resist, experiencing great pain and suffering. Animal welfare laws are contravened and impossible to monitor. For example, the U.S. Humane Slaughter Act (approved in 1958, built on early statutes going back as far as 1901) mandates very specific protocols for management and slaughter of dairy cows. Similarly, serious animal welfare legislation has been in place for decades in most industrialized countries, including Israel. However, because of industry consolidation, increased line speeds, and inspection policies developed in collusion with the meat industry, along with the increasing trend to deregulate business worldwide, inspectors are powerless to enforce humane regulations. Undercover investigators have interviewed staff and videotaped procedures that demonstrate that on a day-to-day basis there is a wholesale disregard for animal distress — that animal handling and slaughter amounts to literal torture. In place of the decent treatment consumers believe, cows are chased with electric prods, or chained and dragged through the chutes kicking and screaming. Inexpertly stunned at a rate of 1 every 10 seconds, they have their throats slit and are quickly moved down the butchering line, sucking in air and bellowing with their eyes bugging out, dying little by little, sometimes having their heads skinned while still fully conscious. you can see the tears of a cow.